I have made nothing better than Roasted Capsicum Jam. This appraisal includes my children. After I first prepared samples to be shared with family and friends, I started getting Christmas presents and people remembered my birthday. Then, one day after Harry had finished giving me a pedicure, I thought, “This product could make a lot of people very happy, especially me.” In 2001, my Family and I opened the Geoff Jansz Food Store in Bowral and we sold properly made, beautiful foods to our largely local clientele. Roasted Capsicum Jam was always on the shelf along with many of its siblings: apple balsamic relish, Moroccan Onion Marmalade and many, many more. The greatest demand, by far, was for Roasted Capsicum Jam and before long we noticed customers pre-ordering their supply before venturing out for a Sunday drive to Bowral; apparently a wasted trip without returning home with the loot. One of the surprising aspects of Roasted Capsicum Jam is its versatility. I will post as many recipes and suggestions as I can, and also the many suggestions that continue to be sent to me. This is one of the all time favourites and is so easy to prepare. It has turned out to be one of the best ‘Get Out of Jail Free’ recipes and makes for a wonderful first course while you focus efforts on the mains. Here I am using an ash covered Australian Brie, so don’t be alarmed at the blackened surface. 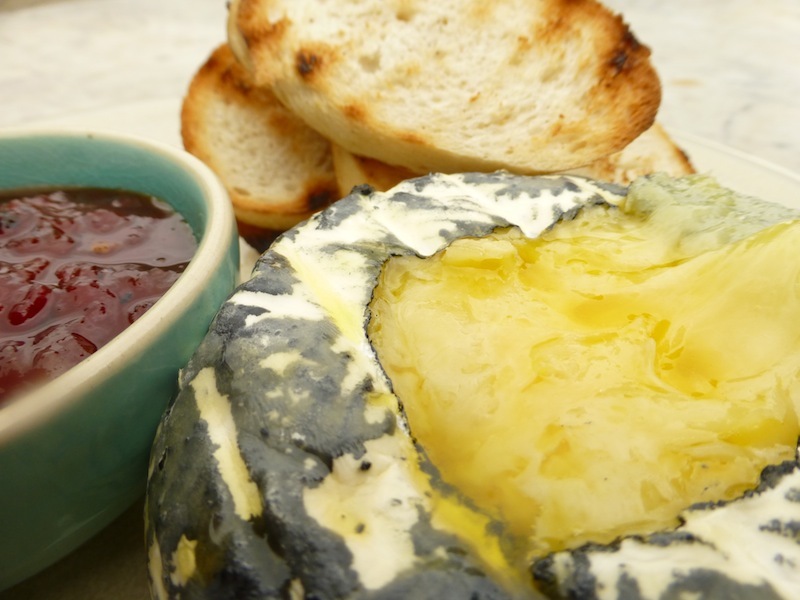 Simply, bake the Brie or Camembert at 180°C until the centre is just soft, say 4- 5 minutes. Then, cut an opening in the lid (see picture) and proceed to use the Brie as a mini fondue. Either pour the Roasted Capsicum Jam over the baked Brie and serve with a spoon onto croutons , or scoop out the warm, unctuous, richly flavoured, gooey Brie onto croutons and top with a little Roasted Capsicum Jam. Your guests will love this. The more you leave the Brie in the oven, the more molten the centre becomes. Don’t worry if it becomes too runny! The cheese firms up slowly out of the oven and still tastes just as great. Just remember for future cheesy adventures to notice the optimum time in the oven for the texture that you prefer. 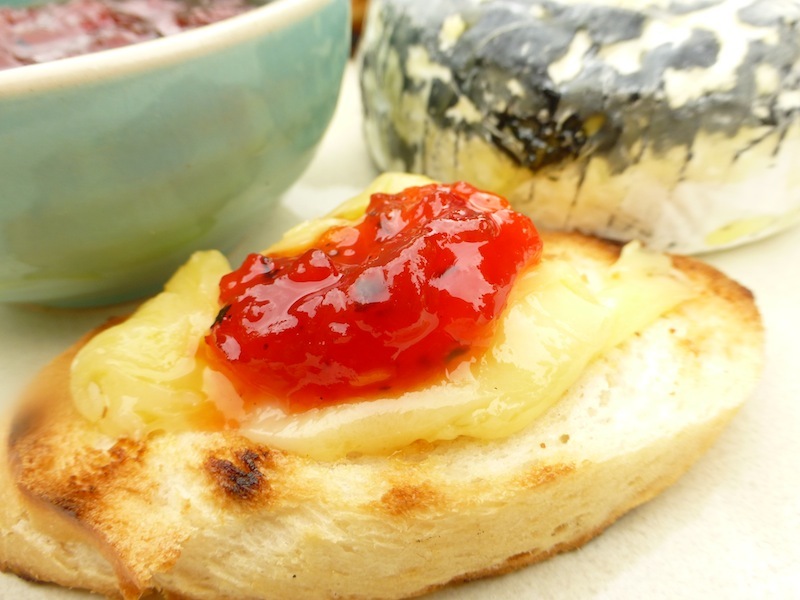 Keep in mind though, that the Brie and Roasted Capsicum Jam will taste beautiful together even if you don’t cook the Brie; it’s just a bit more interesting this way. It’s a good idea to make a little alfoil basket for travelling the Brie to and from the oven; the centre can be quite runny while hot, and a punctured Brie is best contained in this little nest before you take it to the table. Even if it does puncture, it will still be wonderful to eat.